Securly achieves high levels of fault tolerance and low latency via Anycast DNS powered by Amazon's AWS cloud. 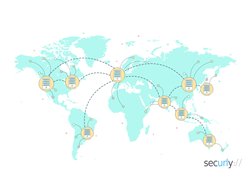 Securly, the leading provider of cloud-based web filtering for K-12 schools, today announced their ability to serve their product via Anycast DNS powered entirely by Amazon's AWS cloud. Much of the Internet revolves around the usage of unicast architecture - wherein each web server on the Internet is represented by a unique IP address. To minimize latencies in network transit times between the clients and the web servers, the web content is brought geographically closer to the client using third party Content Distribution Networks (CDNs). While CDNs work well for distribution of cached or static web-content, they do not work well with dynamic web content, and simply do not work with other Internet protocols such as DNS. The Anycast networking approach flips the traditional approach on its head by allowing multiple physically separated web servers on the Internet to share the same IP address. The client's requests are taken to the geographically closest or lowest latency server using core Internet Border Gateway Protocol (BGP) route advertisements. This eliminates the need for CDNs and extends to protocols such as DNS. Further, Securly's innovative approach prevents the need for setting up Internet datacenter Points of Presence (POPs). This allows Securly to continue to be 100% cloud-based without the need to lease servers from datacenters and manage both private and public clouds across the globe - a practice previous Anycast DNS players had to pick. Simplified deployments. Customers on different clusters no longer have to use different IP addresses. Ability to serve ISPs and access point providers who are location agnostic. Ability to serve mobile users who may travel internationally. Ability to provide fault tolerant uptime even when critical infrastructure fails, by failing over to nearby clusters completely seamless to the customer. Securly is a venture-backed, fast-growth Silicon Valley startup. We are the leading provider of cloud-based web filters for schools with a presence in thousands of schools across the US, Europe, and Asia Pacific region. Beyond school web-filtering, Securly also enables parents to engage in the online safety of their kids by providing the parents - for free - parental controls on school-issued devices, emergency notifications on flagged disturbing activities, and weekly activity reports. Parents can also customize policies to reflect their parenting styles, such as setting time limits on Chromebooks and iPads.